← When is Jewish Valentine Day? Sometimes I think my students leave my class more confused than they walked in. We talk about Moses’ leadership traits and delve into the story of the Golden Calf (to be read in a couple of weeks). As we recall, Moses comes down from Mt. Sinai and smashes the tablet, and the question is, was that ok? Was there maybe an educational purpose to this act? But then, how dare Moses just throw them to the ground? After all, the tablets were made by G-d Himself! As with most ‘which way is it’ questions, I have to say, “yes”. I want them to realize there are more colors than black and white; there’s greater depth. And – as mentioned elsewhere here – sometimes it’s a big yes to two conflicting ideas. In this week’s reading of parashat Truma, we’re learning about the construction of the Mishkan, the mobile temple. The Mishkan is an amazing structure designed exactly for saying yes, but I’ve often felt that the reading about it, is a section for engineers, designers and architects; not for me. I strain to keep all these details in my mind and quickly get lost: how many what where? And this fits together, how? Luckily, I’m in good company. We’re told that Moses too could not figure it out. 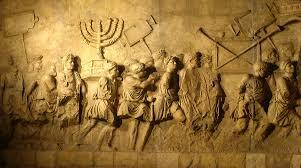 When G-d told him how to build the menorah, Moses just could not see it: one piece of gold with flowers and buttons? לא וְעָשִׂיתָ מְנֹרַת, זָהָב טָהוֹר; מִקְשָׁה תֵּעָשֶׂה הַמְּנוֹרָה, יְרֵכָהּ וְקָנָהּ, גְּבִיעֶיהָ כַּפְתֹּרֶיהָ וּפְרָחֶיהָ, מִמֶּנָּה יִהְיוּ. 31 And you shall make a candlestick of pure gold: of beaten work shall the candlestick be made, even its base, and its shaft; its cups, its knops, and its flowers, shall be of one piece with it. לג שְׁלֹשָׁה גְבִעִים מְשֻׁקָּדִים בַּקָּנֶה הָאֶחָד, כַּפְתֹּר וָפֶרַח, וּשְׁלֹשָׁה גְבִעִים מְשֻׁקָּדִים בַּקָּנֶה הָאֶחָד, כַּפְתֹּר וָפָרַח; כֵּן לְשֵׁשֶׁת הַקָּנִים, הַיֹּצְאִים מִן-הַמְּנֹרָה. 33 three cups made like almond-blossoms in one branch, a knop and a flower; and three cups made like almond-blossoms in the other branch, a knop and a flower; so for the six branches going out of the candlestick. לד וּבַמְּנֹרָה, אַרְבָּעָה גְבִעִים: מְשֻׁקָּדִים–כַּפְתֹּרֶיהָ, וּפְרָחֶיהָ. 34 And in the candlestick four cups made like almond-blossoms, the knops thereof, and the flowers thereof. לה וְכַפְתֹּר תַּחַת שְׁנֵי הַקָּנִים מִמֶּנָּה, וְכַפְתֹּר תַּחַת שְׁנֵי הַקָּנִים מִמֶּנָּה, וְכַפְתֹּר, תַּחַת-שְׁנֵי הַקָּנִים מִמֶּנָּה–לְשֵׁשֶׁת, הַקָּנִים, הַיֹּצְאִים, מִן-הַמְּנֹרָה. 35 And a knop under two branches of one piece with it, and a knop under two branches of one piece with it, and a knop under two branches of one piece with it, for the six branches going out of the candlestick. לו כַּפְתֹּרֵיהֶם וּקְנֹתָם, מִמֶּנָּה יִהְיוּ; כֻּלָּהּ מִקְשָׁה אַחַת, זָהָב טָהוֹר. 36 Their knops and their branches shall be of one piece with it; the whole of it one beaten work of pure gold. At the end of Exodus 25, G-d says to him: “And see that you make them after their pattern, which is being shown you in the mount”. The midrash says that Moses was so lost in the previous description of the menorah that G-d just showed him a picture of what He has in mind, thus “is being shown to you”. Let’s look back at verse 31 above: “And you shall make a candlestick of pure gold: of beaten work shall the candlestick be made”… it seems that there are two different instructions. The first is simple: “you shall make!” But then it follows with “(it) shall be made”, in the passive, as if, this will be done for you – by someone else. Which way is it? Yes. There are things to do and act on and push for; and things to let get done, and life is about sorting those out and finding the balance between them. This entry was posted in shabbat shalom and tagged balancing act, exodus, menorah, mishkan, tabernacle, Torah. Bookmark the permalink.